Vietnam tourism is always known tourists with attractive natural beauty and low tourism costs. In these recent years, Vietnam has gained its popularity in tourism industry in attracting international tourists across the globe whom mostly come from Asia countries, European countries, Australia and America. So, what makes Vietnam so appealing? How many reasons do you need to plan your trip to Vietnam? The initial element that first come to the mind of Vietnamese people when pointing out what make them proud of their country is the amazement of natural geographical resource. Vietnam is probably has been heard through many travel articles, news and magazines but what impress foreign friends the most is absolutely by the Hollywood’s blockbuster in 2017 called “Kong – skull island” – a remake of Kong movie in 1993. Vietnam’s Ninh Binh province and Son Doong Cave had been chosen to film the movie and was placed equally as famous exotic view of Hawaii island and Australia. For the director, the scene in Vietnam was the most outstanding. The director also said Vietnam has presented the “perfect aesthetic” for his movie. Tom Hiddleston and Brie Larson, two leading role of the movie, gave high compliments and recommendation to travel to Vietnam. In an interview with Channel News Asia, “You are trying to find something that is completely untouched and looks unlike anything you’ve seen before. And Vietnam is an answer to that” said Larson. 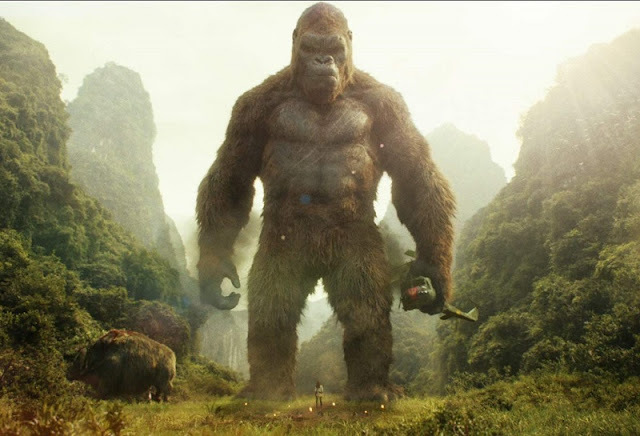 Furthermore, it is a great pleasure and honor to know the will of the director is that the remake of King Kong would be the source of inspiration for more people to come to Vietnam. » Hanoi to Ninh Binh Tour to discover Kong's Home with us. Why not? Recently, not only the awe-inspiring destinations that attract international friends but also the cuisine of Vietnam. 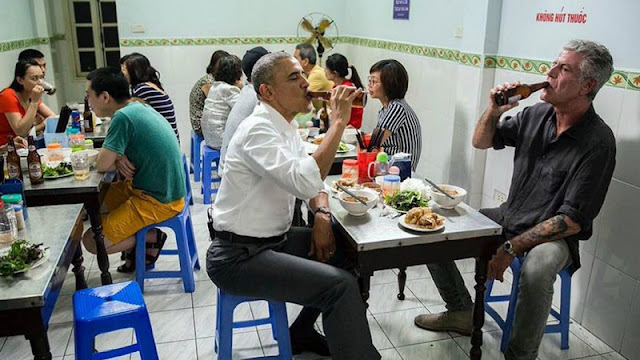 It is out of expectation to hear that the most powerful man on earth chose a Vietnamese’s street dish “bun cha” for dinner in his business trip to Vietnam – no one else but the President of the United States Barack Obama on May 23, 2016. The U.S leader gently shook hand with the public and sat down on a plastic stool to have a meal of rice noodles with grilled pork and meatballs and a bottle of Hanoi cold beer. What could be simpler than that! And that meal only cost $6. On the following day, after the meeting with Vietnam’s top officials, Mr.President also said that he would like to try Vietnamese iced milk coffee. “I look forward to the opportunity to meet with the Vietnamese people… Maybe I will try some ca phe sua da”, he said, accurately using the name of the common drink. Another reason that motivate foreign travelers coming to Vietnam is a phenomenal event a few years ago in America in 2012. A blind woman whose origin is Vietnam – Christine Ha had won the crown of Masterchef in the 3rd season of the show. She continuously surprise the judges in which include Chef Gordon Ramsay during the competition. What brings the biggest surprise is that in the finale of the show, she cooked a traditional dish of Vietnamese people, a common dish that shows up on the tables of Vietnamese’s everyday life, called braised pork belly with rice. Even Gordon Ramsay praised that the pork was delicious “It’s crispy in the outside, buttery and rich in the middle, and it just melted in your mouth”. What more to say but thanks to Christine Ha had successfully delivered Vietnam’s traditional food out to the world. The last figure that also played his part in bringing Vietnam onto a new level is Cristiano Ronaldo. In April 2017, he officially signed the contract of owning a penthouse in CocoBay tower in Danang, Vietnam in Madrid. He stated that he was fascinated by the beauty of the beaches of the coastal in the centre of Vietnam “The coastal scenery reminds me of my hometown Madeira in Portugal. It felt like being home”. There are thousands more reason why Vietnam is one of the most charming places to visit on earth. Besides, Vietnam has also been loved by great people like President Barrack Obama, Cristiano Ronaldo; hence, there is no other way millions of other people in this planet would say no to visit Vietnam. Perhaps, there might be countless factors that make Vietnam appealing and it would be a never-ending list that make foreign tourists adore Vietnam. Vietnam will definitely electrify all the senses and seize tourists from all angles. Even Vietnamese people are head over heels falling in love with Vietnam!